U.S. stocks rose sharply on Wednesday for a second straight day as strong earnings from General Motors and Facebook lifted sentiment. But the major averages still posted big October losses. The Dow Jones Industrial Average surged 241.12 points to 25,115.76, led by Visa, bringing its two-day gain to about 650 points. The S&P 500 gained 1.1 percent to 2,711.68 as consumer discretionary and energy outperformed. 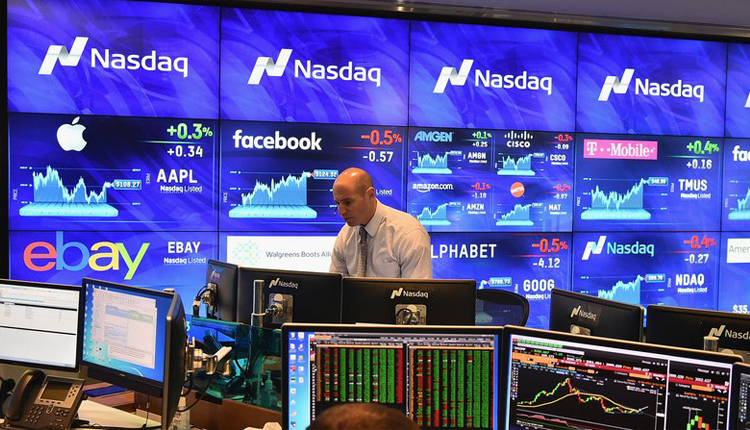 The Nasdaq Composite advanced 2 percent to 7,305.90 and briefly climbed out of correction territory. The Dow dropped 5.1 percent to post its biggest monthly fall since January 2016, when it dropped 5.5 percent. The Nasdaq plunged 9.2 percent, its largest monthly pullback since November 2008, when it shed 10.8 percent. General Motors shares spiked 9.1 percent after the company reported quarterly results that easily topped expectations. The company said it sold fewer cars in the third quarter, but at a higher price, boosting its bottom line. But Ryan Detrick, senior market strategist at LPL Financial, thinks the situation is not as bad as it seems. U.S. stocks closed higher in the previous session, as markets pared some of the month’s losses. Such a move is not uncommon as a month of steep declines comes to an end. According to data from Bespoke Investment Group, when the S&P 500 is down more at least 8 percent with two trading days left in a month, the index has bounced back 80 percent of the time in those last days. The data date back to 1952. On the data front, private payrolls rose by 227,000 in October, according to a report from ADP and Moody’s Analytics. The gain is more than economists polled by Refinitiv expected.